Looking for a career that allows you to be honest and helps you remain unbiased when providing your clients with financial advice? Financial Alliance is what you’re looking for! 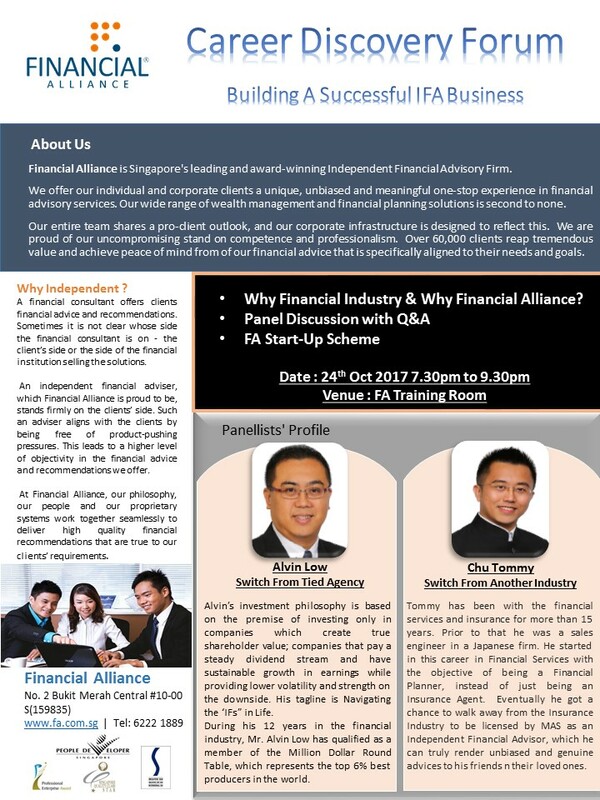 In addition to being the leading and award-winning Independent Financial Advisory Firm in Singapore, Financial Alliance is known for its competence and professionalism when it comes to providing both their corporate clients and their individual clients with objective financial advice. In compliant to MAS’ Fair Dealings, Financial Alliance fully supports its representatives’ effort to be unbiased by ensuring that everyone is free from product-pushing pressure. As such, Financial Alliance has over 60,000 clients and is continually expanding. 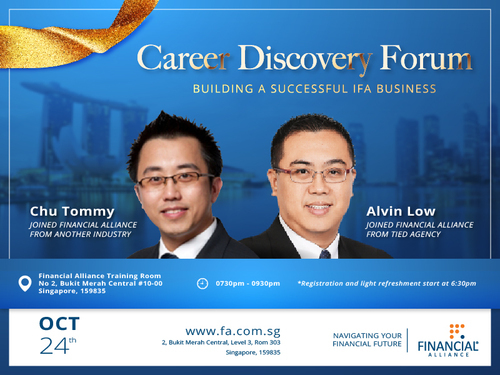 Sign up now to join Alvin Low and Chu Tommy on the 24th of October 2017 (Tuesday) to learn more about their journey and why they switched to Financial Alliance. In addition to possessing 12 years of experience, Alvin is also a member of the Million Dollar Round Table that represents the top 6% best producers in the world. Licensed by MAS as an Independent Financial Advisor, Tommy has more than 15 years of experience in providing financial services and insurance advice.